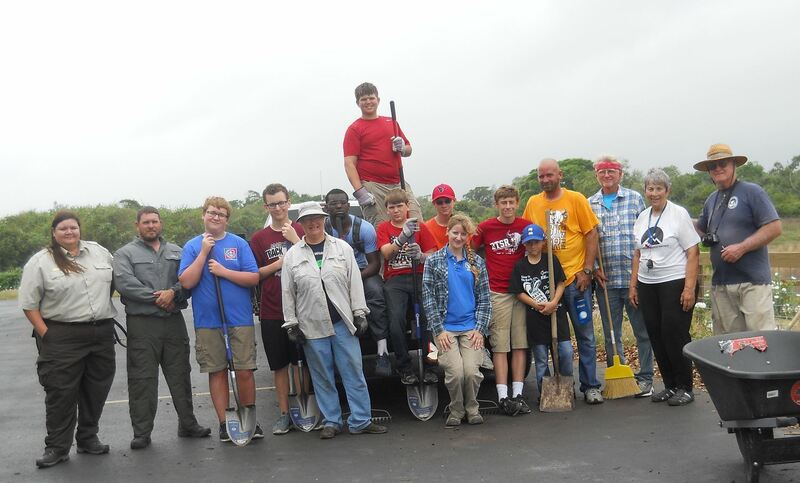 Members of the Rough Riders 4-H Club, from the Austwell-Tivoli ISD, did an amazing job in our pollinator garden October 8th. They removed a mountain of undesirable plants from the garden in record time! Many thanks to them for their hard work. A couple slipped away before we could get a photo, but we appreciate each and every one of them! FAMI Honored as Steward of Nature! 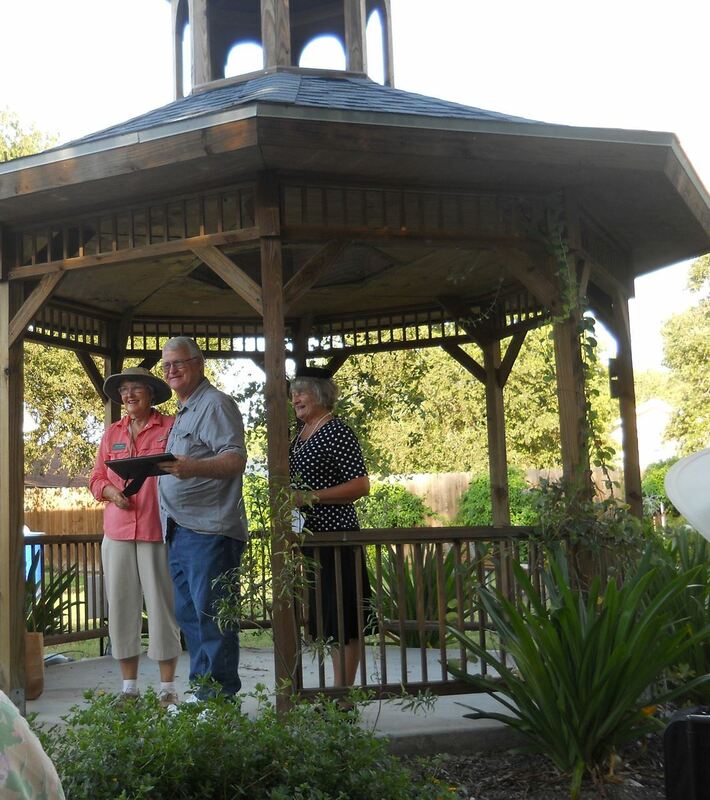 The History Center for Aransas County honored Friends of Aransas NWR and others that were chosen as Stewards of Nature in Aransas County. President Fred Lanoue was presented a certificate at a reception September 10th. Organizations and individuals honored were chosen by members of the community for their efforts to preserve, protect, and restore the natural environment. The reception marked the opening of the History Center's exhibition, Stewards of Nature, which will be on display through November 12, 2016. The exhibit celebrates those who have worked to preserve the unique environment of the Coastal Bend, with its barrier islands, marshes, and oak mottes. There will be posters telling the stories of the honorees. You can see more about the exhibit here. We are excited and proud to be part of this exhibition! This study was done on the introduced Eastern flock, but it is quite interesting. There was a great deal of excitement when Whooping Cranes were recently sighted on the refuge from a boat, with people thinking they had arrived back very early. Actually, they never left! Click here to read Sara Sneath's article in the Victoria Advocate. The Youth Conservation Corps workers spent 8 weeks working in different areas of Aransas National Wildlife Refuge. The students, from Austwell/Tivoli ISD, along with their crew leader Chris Sandoval, spent one day working in the pollinator garden. They did an amazing job & accomplished more in one day than we ever imagined! The YCC is a win-win program. The students got a chance to earn money and learn more about the natural environment at the refuge. The refuge got help with various projects. This was a great group of hard workers. Our next work day in the garden will be Tuesday August 30th. If you'd like to participate, contact us for details. In June only, the garden maintenance work day has been changed to the 4th Monday, June 27th rather than the usual Tuesday. Please email us for more information. Great news – our colleagues with the Canadian Wildlife Service report that 78 Whooping Crane nests are confirmed on the cranes' breeding grounds at Wood Buffalo National Park. Here's to a successful nesting season! Earth Day Bay Day Big Success! 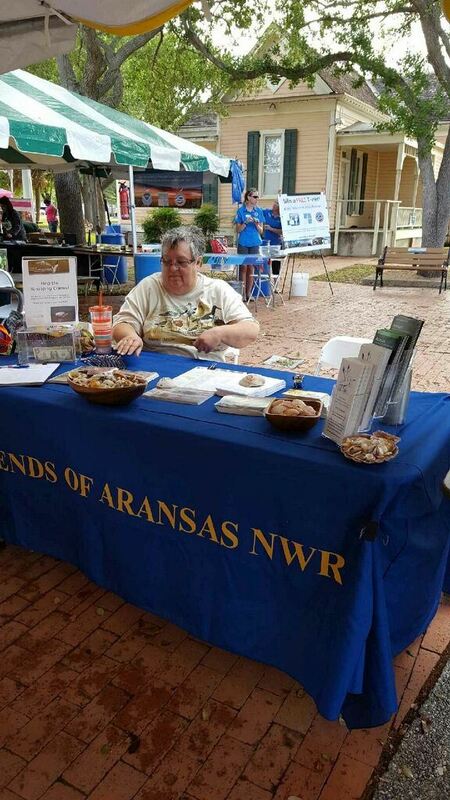 Linda Swiggett and Gay Heijmancik did a wonderful job representing Friends of Aransas and Aransas National Wildlife Refuge at Earth Day Bay Day in Corpus Christi on April 9th. They gave out 500 shells they had painted, as well as Roseate Spoonbill postcards and Aransas NWR pencils, and information about the refuge. Linda has created a photo album that she had on display at the table, and that got a lot of interest. Linda & Gay talked with people about the refuge and invited them to come out to see it for themselves. They signed up over 50 people that want to receive our e-newsletter to keep up with what is going on at the refuge. Thank you ladies for doing an outstanding job! Now that most of the planting has been done, the garden is really taking shape. On April 13th, Ellen Reisinger, Linda Frank, and Fred Lanoue completed the point irrigation system. Then came "mulch day", April 16th. Jen Brown, Environmental Education Specialist, arranged with Boy Scout Troop # 135 to help in the garden as their service project. The plan for the day was to get the new plants mulched. The scout group, from Ganada, TX, was absolutely amazing! It was hard work, and they got more accomplished in a couple of hours than we could have done in a day! They even made sure that all the mulch was cleaned out of the trailer & off the parking lot, and that all the tools were collected when they were done. We certainly appreciate their help! 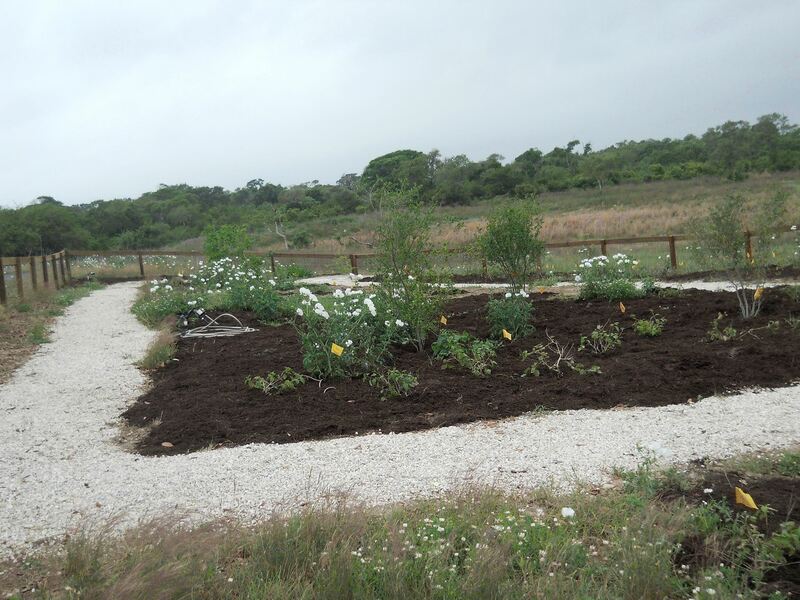 The pollinator garden is an on going project. If you would like to be involved, please contact us. For more photos, visit our photo gallery. City of Rockport contributes to Water for Wildlife! 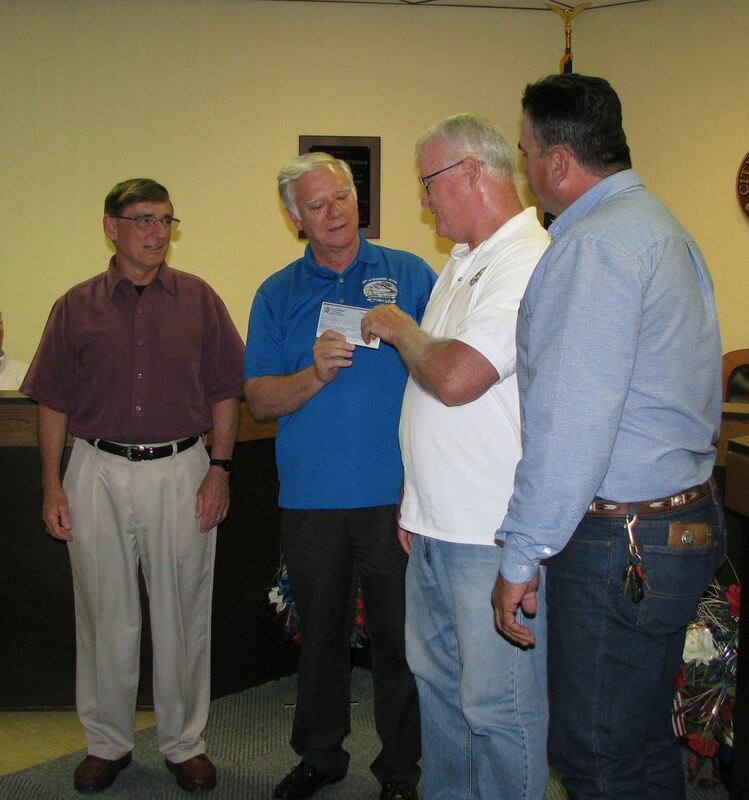 At a recent City Council meeting, Rockport Mayor C.J. Wax presented Friends President Fred Lanoue with a check for $1085.00. The check represented a portion of all the paid entries for the 2016 Whooping Crane Strut. The money will be deposited in our Water for Wildlife Fund. The fund is used to drill new wells, and rehabilitate old ones to ensure reliable fresh water sources for Whooping Cranes & other wildlife in times of drought. The fund was most recently used to drill 2 wells on Matagorda Island, with solar powered pumps. We hope to rebuild the fund, as there is an older well on the island that needs to be rehabilitated. We enjoyed partnering in this annual event, which is a fun time for all ages. You can see photos of the event in our photo gallery. Thank you to the City of Rockport for helping us help the Whooping Cranes! Left to right: Parks Department Director Tom Staley, Mayor C.J. Wax, Friends President Fred Lanoue, Parks Department Staff Rick Martinez.